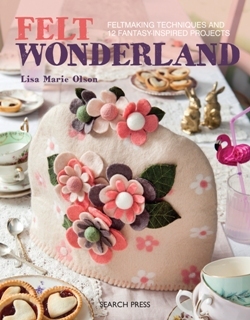 Step into wonderland with Lisa Marie Olson and learn how to transform sumptuous wool fibres into beautiful felt items. Handmade felt is irresistibly soft and lovely to work with, and before you know it youll be caught up in the magic of this gorgeous material and making beautiful, tactile gifts for you and your loved ones. The clear, step-by-step photographs and instructions will teach you the art of wet felting, from basic flat-felting techniques through to using a resist and working around a 3D mould. There are 12 gorgeous projects, ranging from decorative teacups, a teapot and a tea light holder to more practical pieces such as a pretty handbag, a lampshade and cosy slippers all inspired by Lisas love of fairy tales and fantasy stories, including Alice in Wonderland. You can embellish these lovely felted items in many different ways and create your own fabulous works of art. She also includes other techniques such as needle felting, hand stitching, embroidery and applique to further embellish the projects. The projects can be followed exactly, but also provide you with the inspiration to let your creativity loose and customize them to your own style. Paperback, 96 pages, Search Press.